It’s 8am, the roller door goes down. It will now be another 9 hours until that door goes up, your car pulls in and I have the entertainment of your company again. 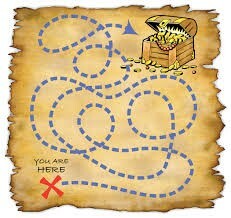 So what shall I do in the mean time? The yard looks the same as it did yesterday. I’ve sniffed every leaf there is to sniff a thousand times before… I know! I’ll run border control! …………………………………………………………………………………………..done Now what? Well, we all know what happens next. They dig up your plants, they chew your furniture, they bark constantly… enough to have a note from the neighbour waiting for you on your doorstep! Sound familiar? These are all signs of boredom. And can we blame them? Could you imagine spending all that time alone in a non-stimulating environment? This is where environmental enrichment comes in to play. the time whilst you’re out and give them something to look forward to with you leaving. 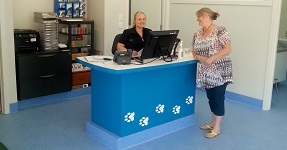 In our vet clinics. Coromandel Valley (near Blackwood0 and Mclaren Vale (near Seaford) This is all part of the service we provide. 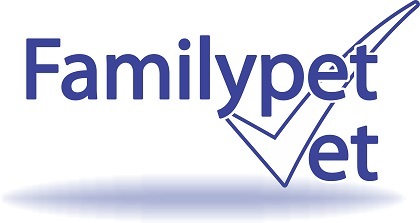 In our Puppy Preschools we teach you the Basic Dog Training skills you need to help your dog coope with you being gone all day. But we can Let you in on the secret Now. Read on. 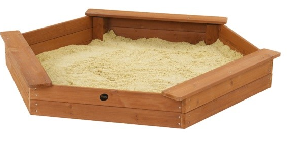 Provide a sandpit for your dog to dig and roll around in; you can buy one or try building one yourself. You can then hide and bury some treats in the sand. Dogs love to dig; this will create lots of fun and mental stimulation for your dog. It also gives your dog an appropriate place in the yard to dig, rather than the flower bed! Treat balls and bustercubes are a tasty way to entertain your dog while they’re home alone. 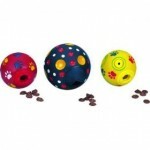 Instead of giving them their breakfast traditionally, try placing it in either a treat ball or bustercube. As your dog sniffs and pushes the cube or ball around their biscuits will gradually be released. 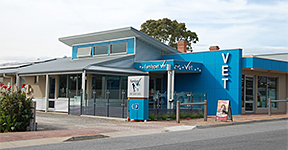 Treat balls and bustercubes are available at most pet shops and vet clinics in a range of sizes to suit your dog. 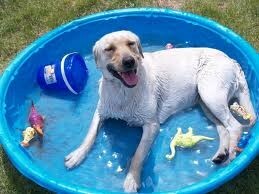 Does your dog love water? Why not give them a paddling pool! It doesn’t need to be huge, just enough for them to splash and sit in. The plastic children’s seashells are the perfect size. 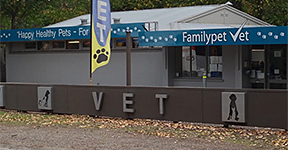 Ensure your dog can get in and out easily and the water isnt too deep for smaller breeds. Waterproof toys or treats such as apples, make hours of splashing entertainment. 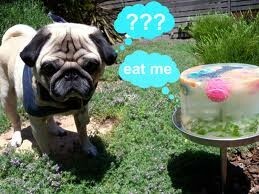 Making tasty iceblockes will provide a long lasting distraction for your dog. Simply wash out an old container such as empty icecream container or takeaway food container, add some yummy treats or vegetables your dog will love, then add water and freeze! You could even try adding some chicken or beef stock for extra flavour. Once frozen, remove the plastic container and give the iceblock it to your dog. As the ice melts treats are exposed, giving your dog hours of tasty fun. This is ideal for summer. If your dog has a strong jaw and loves to chew, kongs and everlasting treat balls are virtually indestructible. 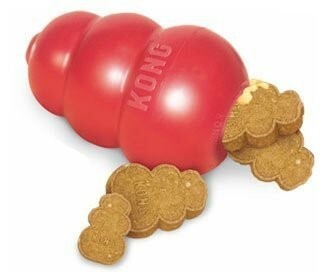 Kongs can be stuffed with your dogs most desired treats and the everlasting treat ball is as it sounds; it has a hard, longlasting treat inserted inside a tough rubber ball. Hours of amusement! 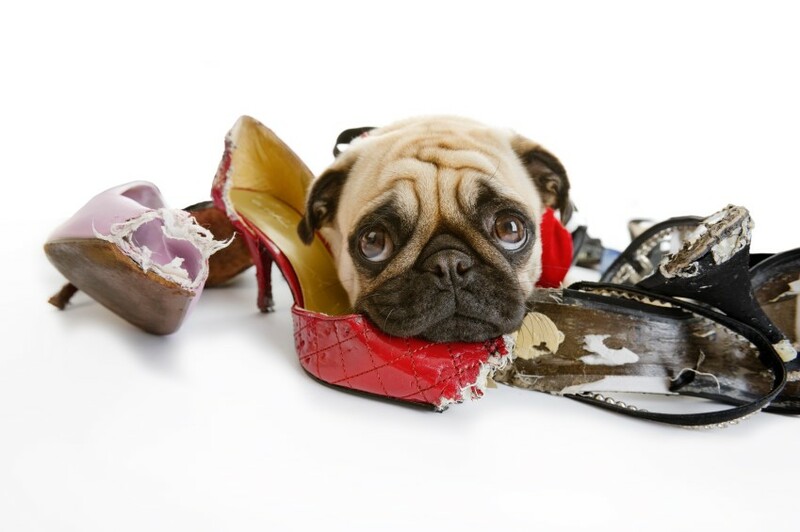 Chewing releases endorphins for dogs, much like exercise does for us. 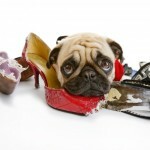 This is why dogs love chewing and will enjoy knorring on a kong or treat ball. The cushions on your outdoor table setting will appreciate it! 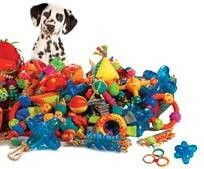 It’s possible for your dog to grow bored of some toys which is why it’s important to have a variety. 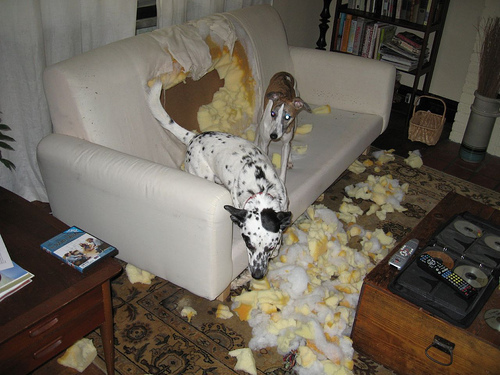 Try only allowing your dog to have a few toys at one time. Then rotate them throughout the week to prevent them losing interest. Let your dog see past their yard. Some dogs enjoy knowing what is going on around them. 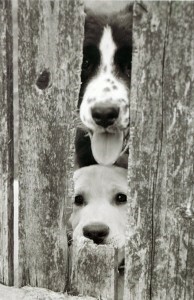 Providing a peephole in the fence can give your dog plenty of entertainment watching people, dogs and other interesting things go by.